Selecting a software solution to support all the business processes for the entire company in the most effective way – while at the same time meeting all the specific, detailed requirements from all stakeholders (departments) involved in such a project – can be a huge challenge for every company, large or small. In this article, we will elaborate on this challenge by focusing on enterprise resource planning (ERP) and customer relationship management (CRM). This already makes it sound as though a trade-off needs to be made between an integrated solution, which cross-functionally integrates all business processes within a company (ERP software), and software that focuses primarily on one specific part (i.e. CRM) of this business process (best-of-breed [BoB] software). Both have their own benefits and disadvantages, which are quite obvious and will therefore not be discussed here. In the past, this ERP vs. BoB trade-off was regularly solved by interfacing/integrating one software solution with the other, which potentially solved the trade-off issue. However, in most cases the integration of software systems led to disappointments, since it involved higher costs than expected or promised to get this integration working correctly. When it did work correctly, even more costs were incurred for maintaining the integration to keep it working properly (i.e. when updating the separate software solutions). In some cases, the full integration between the system (as desired) did not seem to be technically possible at all, leaving the company with a semi-integrated system against costs which were more than expected/promised upfront. In this article, we will discuss how the ERP vs. BoB trade-off thinking described above is, in most cases, no longer accurate, as nowadays there are platforms and solutions that can actually offer an organization the best of both worlds. For example, our DynaRent Solution Suite (based on Microsoft Dynamics 365 for Finance & Operations [ERP]) offers an out-of-the-box integration with Microsoft Dynamics CRM (BoB for CRM). In this case, the Microsoft Azure platform enables us to use fully standard integrations among all their products (amongst other Dynamics CRM) and allows us to seamlessly integrate our DynaRent ERP solution, for equipment-driven rental and services companies, with the BoB CRM software offered by Microsoft. Updates are no longer an issue either, since the platform manages these updates and ensures that all software is operational after updating. 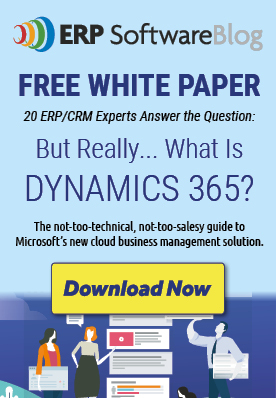 It also enables the company users to work in the user interface of their choice – Dynamics CRM or DynaRent – and still have all necessary data integrated from both systems, where and when they need it, in real time. If you want to learn more about CRM, ERP, and the seamless fit we can offer with our DynaRent Solutions Suite, please feel free to send us an email at [email protected]. We would be more than happy to set up a meeting and discuss this topic with you.